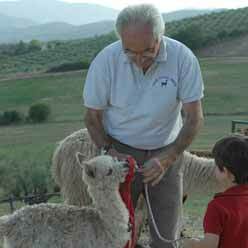 MARIDIANA is the first farm in Italy to have bred a large number of alpaca and angora goats for fiber production. The MARIDIANA herds roam the green hills of our 100-acre Umbrian farm, located in the Niccone Valley in High Tiber Valley, near the border of Tuscany. MARIDIANA has more than 15 years of experience managing alpaca. In collaboration with ENEA, a national Italian research center, and the Universities of Perugia and Camerino, MARIDIANA has conducted a series of studies on alpaca, including their acclimatization, health and prevention of illness, nutrition, behaviour, and genetics. The MARIDIANA ALPACA pilot program on fiber production, has been co-financed by the European Economic Community, which in 1997 designated MARIDIANA as a demonstration breeding farm with the goal of extending the concept to rural areas that can benefit from raising alpaca. Gianni Berna, Partner and Administrator, MARIDIANA s.r.l. - is an economist, and has successfully organized and managed innovative agricultural projects in Umbria and in numerous third-world countries. All of the MARIDIANA alpaca herd traces its roots to northern Andes (Chile, Perù and Bolivia). 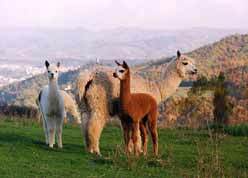 While all MARIDIANA alpaca are the Huacaya and Suri breed, they come from different strains. This combination of alpaca from such entirely different sources eliminates any potential problems with inbreeding. All MARIDIANA alpaca are of high quality. The average fineness of MARIDIANA ALPACA fiber is 24µ - a highly desirable rating. MARIDIANA has one of the largest alpaca herd in Italy. This abundance permits the buyer a good choice of animals. MARIDIANA has males from 1 to 6 years of age and pregnant females from 3 to 8 years old. Also available are cria from 6 to 12 months. The prices for a pregnant female ranges from 3500 EURO to 7000 EURO according to age, colours, conformation and fiber micronage. For adult males prices range from 3000 to 5000 EURO, while for crias they range from 1500 to 2500 EURO. Besides alpaca, Maridiana has also 60 angora goats, for mohair fiber, available for interested breeders. If you are interested in raising alpaca or mohair and would like to visit MARIDIANA, please do not hesitate to contact us for additional information or an appointment.